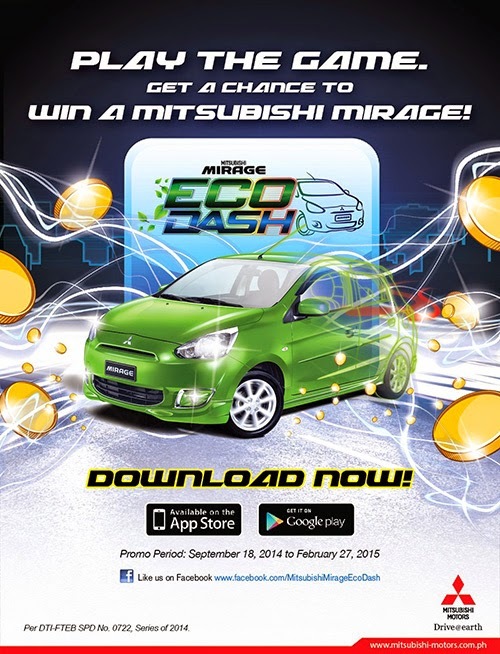 Mitsubishi Motors Philippines Corporation (MMPC) is giving you a virtual test drive for their new Mitsubishi Mirage with the release of the Eco Dash Gaming app. Aside from having to virtually experience the feel of driving the Mitsubishi Mirage, players finding their way to the top of the leaderboards will have exciting prizes. The top 5 in each month will have an iPad mini until February 15. Likewise, Mitsubishi will also give a brand new Mirage GLS MT for the top player in the culminating event. MMPC will have a Mirage Eco Dash finals event wherein the top 10 in the leaderboards by end of February 2015 plus the 3 wildcard winners from the offsite mall competition which will be done in Manila, Cebu and Davao, will compete to determine the overall champion and win the Mirage GLS MT grand prize. The app features the Mirage Eco Dash which players drive their very own Mitsubishi Mirage as they navigate obstacles, collect coins and power-ups in a mad dash to be on the top of the online Eco Dash leaderboards. Mirage Eco Dash can be downloaded in the App Store and Google Play Store for free.